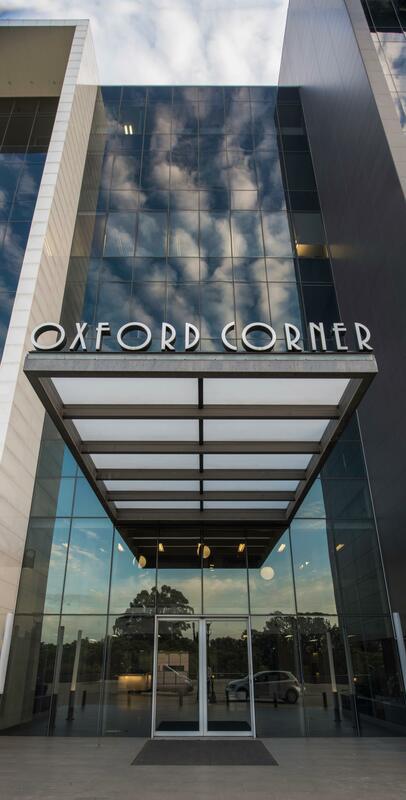 The ‘Tiber Rosebank’ development occupies a key site on the corner of Jellicoe Avenue and Oxford Road in Rosebank. 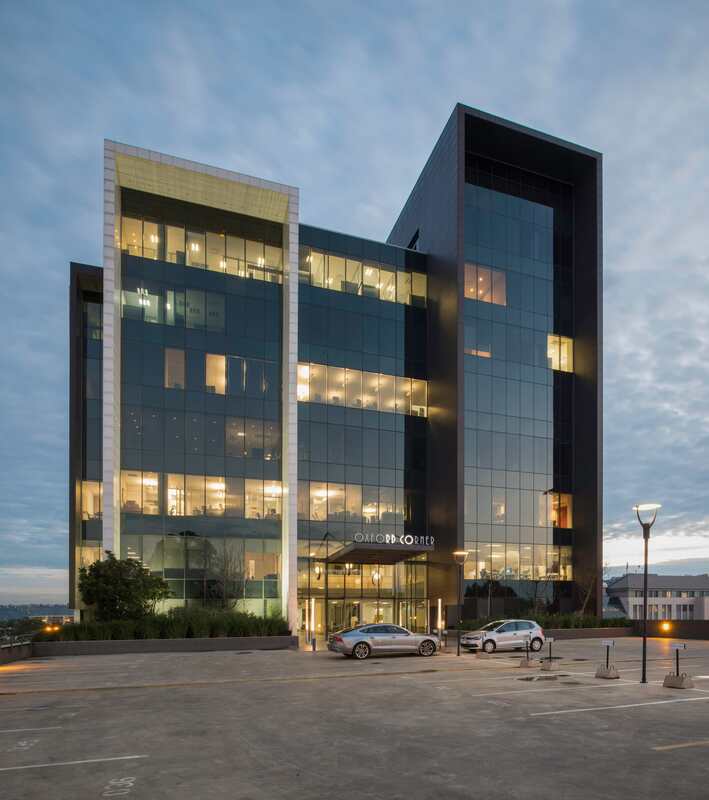 The building, completed in 2010, incorporates 9,000 square metres of lettable area in an eight-storey tower atop a raised parking podium. 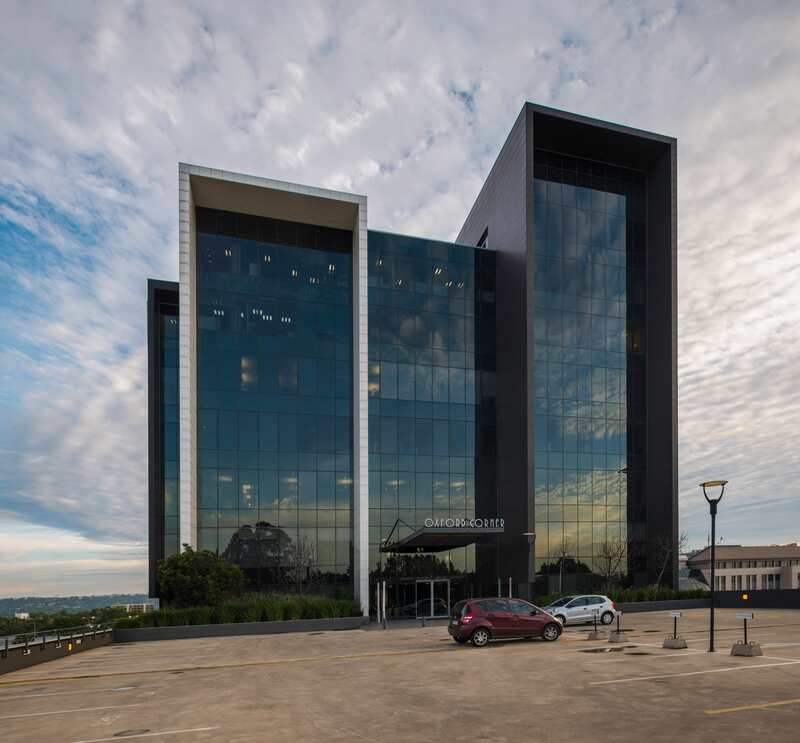 The decision to increase the height of the building as much as possible responds to the client brief to create a ‘gateway building’ on a major arterial. 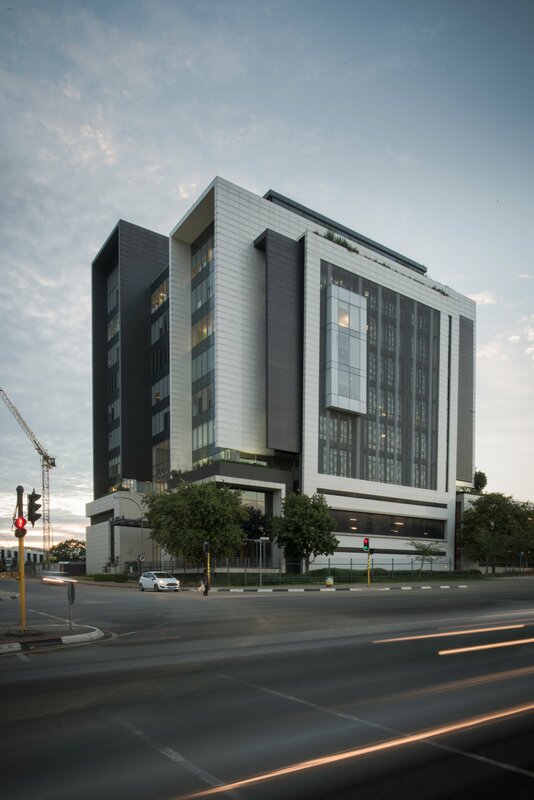 The intention was to manipulate the massing of the building to good sculptural effect, creating a hard-edged work of urban architecture that takes the scale and texture of the lush forest-like setting of Johannesburg’s northern suburbs into consideration. The raised parking plinth was designed to allow intensive plant growth that softens the interface of the building with the pocket park at its base on Oxford Road. Future commercial usage at ground level has been made possible, to provide an active street edge. 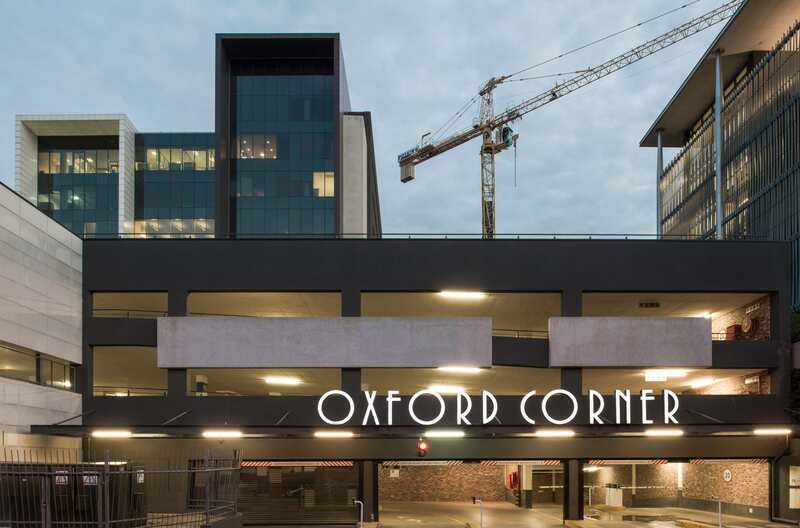 With the Rosebank Gautrain station within short walking distance, the basement was designed to be altered where parking bays can be removed, and shops added on the street facade. 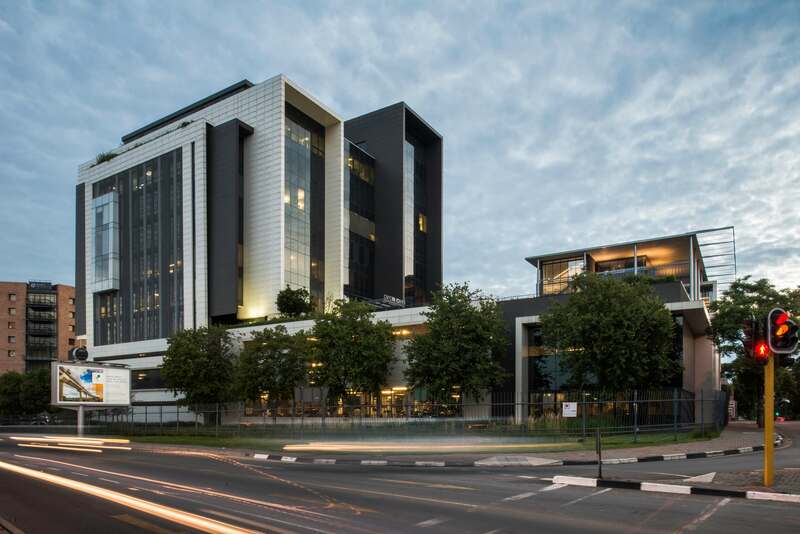 This decision is a future-proofing design idea that anticipates the realisation of the vision of Rosebank as a higher-density and more urban node in the city of Johannesburg. The east and west facades are defined by the careful placement of openings. 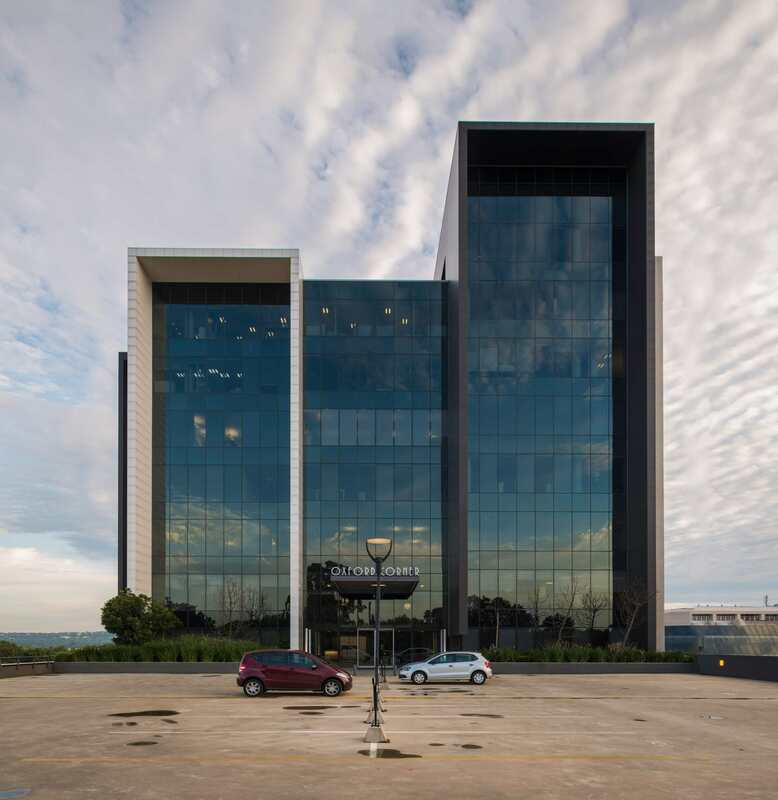 The architecture responds to two different scales: one relating to the south-north traffic axis past the site, the other at the pedestrian and office worker scale. The night-time appearance of the building was an important design consideration. After dark, the filigree sunscreen on the eastern facade appears to dissolve and provides a finely textured setting for a projecting, internally illuminated glass box. Internally, abundant natural light reaches all parts of the floor plates. Due to constrained site dimensions, the atrium has a tall and narrow vertical forced perspective, with the view to the sky accentuated by three cone-shaped sculptural skylights painted in primary colours. 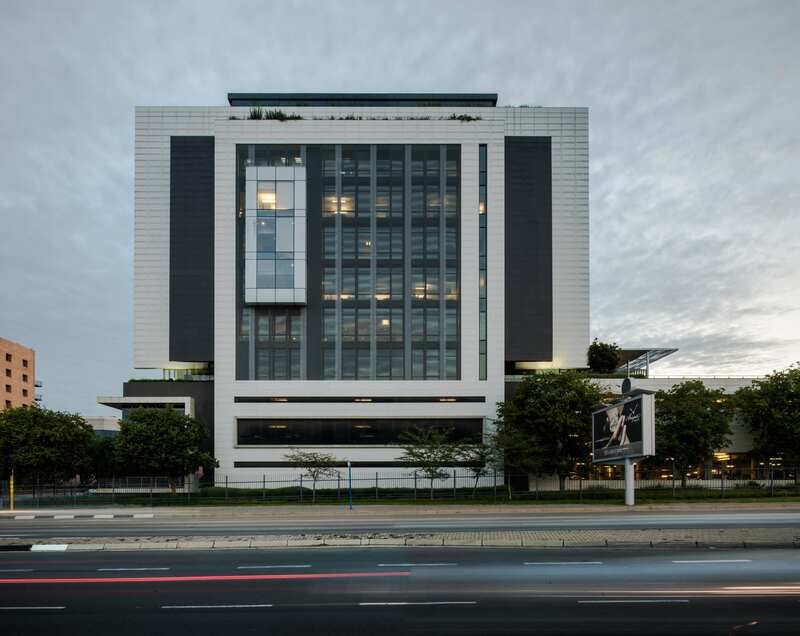 The completed development is a fitting counterpart and a respectful neighbour to the much-lauded architecture of the Park Hyatt Hotel, which at the time of its completion sparked wide debate in architectural circles. 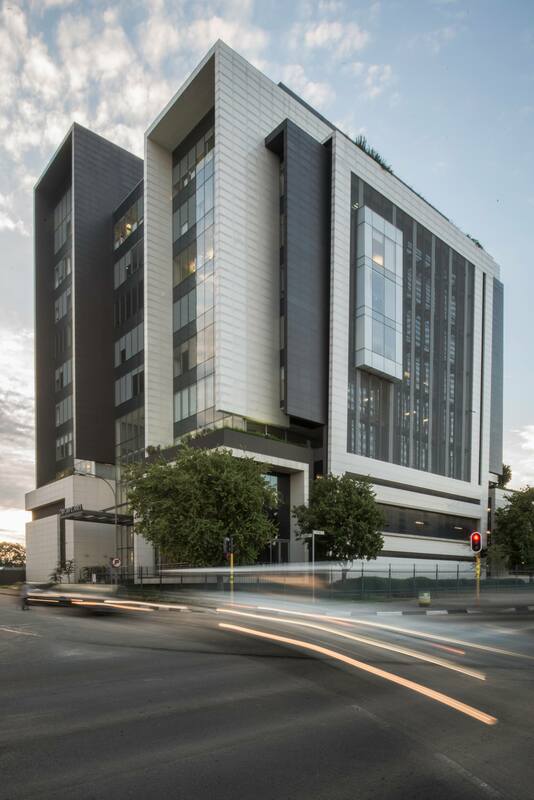 Tiber Rosebank sets a new benchmark for ambitious and finely crafted corporate architecture in Johannesburg.